Is there an anime con near me? When’s the next Star Trek convention? Are there any gaming events in my State? There’s a great way to answer these questions, one I’m sure you were told many times as a kid; “Look it up.” Which is all fine and dandy to say, but how is a person to do that? Okay, this one may seem obvious at first blush but there are tricks to using keywords in a search engine. conventions march 2011 instead of what conventions are happening this month? convention “cosplay contest” gives only pages that contain the EXACT phrase ‘cosplay contest’, convention cosplay contest will return any page that has the words ‘convention’ and ‘cosplay’ on it with only some of the results also having the word ‘contest’ lurking around somewhere. gaming convention 2011 -pax -fragapalooza will EXCLUDE all results mentioning either PAX or Fragapalooza; in this way you can find new conventions without just getting results for the same events you already know about. movie memorabilia convention will return pages even if they don’t have the word ‘convention’ while movie memorabilia +convention only includes results about cons. Want to find out if there are any horror conventions in the Michigan area this year? Enter horror convention Michigan 2011in the search field of your preferred engine. So, you’re looking at a huge page listing every known anime convention in the world. How do you find out if there are any in your city without scrolling until your eyes cross? You can also locate the Find feature in your browser’s menu, though every browser puts it somewhere else (which is one of the reasons why keyboard shortcuts are also a wonderful thing). So, once you have the Find feature of your browser open just type the word or phrase you want to search for into the field and the browser will show you the first instance of that word/phrase on the webpage. Then click the “next” arrow in the Find box to go the next place your keyword is mentioned. 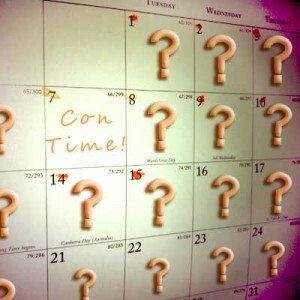 AnimeCons.com; lists just anime conventions. Creation Entertainment; this is the company that produces a lot of the Official conventions for media properties like Star Trek, Twilight, etc. http://con-news.com/ is a good blog, similar to Convention Fans.